Discussion in 'Carothers Performance Knives' started by Nathan the Machinist, Dec 10, 2016. Can we please minimize chit chat in this particular thread. There are people subscribed to it who get a notification every time someone posts. When it isn't an item for sale it screws up the "signal to noise" ratio. Thanks. 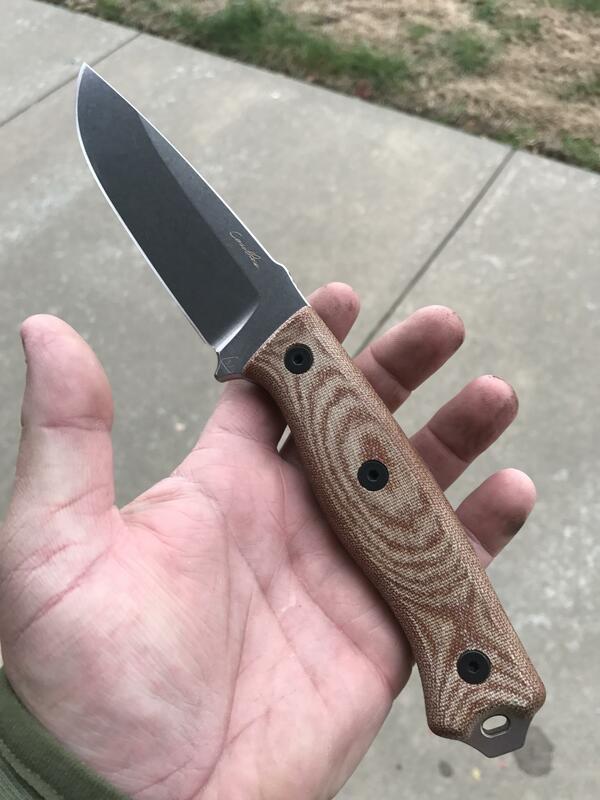 By request I'm creating this thread here so folks can buy, sell and trade CPK knives and gear, including sheaths (yours or mine), scales (yours or mine), fancy screws etc, and also pimping and sharpening services. This thread falls outside of normal BF sales threads so normal feedback isn't available. I'm limited in my time and ability to moderate this thread so if folks start running into trouble here I'll close it. Any membership level is adequate to buy, but only gold and above can sell or start a post. If you're conducting a trade with a registered user I suggest you wait to receive your item before shipping. I reserve the right to delete or modify items as I see necessary. For example if you post your authentic Conan the Barbarian collectors edition sword for sale (not a CPK related posting) I will edit your post to be about your My Little Pony collection and then I will mock you. Also, don't post links to outside sites such as ebay. Anything you post must be yours, in your possession, and except for services such as a custom sheath etc. it needs to be finished and ready to go. Custom work that is not ready to ship needs to be accompanied with an accurate lead time. You can re-post items, but you must wait two weeks. Lets please be courteous to each other and take care to package items appropriately so they're received safely, try to describe all defects accurately, and minimize delays in shipping. Hold onto the money (don't spend it) for a reasonable amount of time so you're able to issue a refund if there is a problem. Oyster, T.O., walnutbear and 1 other person like this. Looking to trade a CPK FK Black buffed Micarta. Excellent condition (skinned out 1 deer). Sharp factory edge never sharpened. Kydex sheath included. For questions, offers, pictures etc please send me a pm, email, or text. I am looking to buy or trade (can offer CPK as well) for pretty much anything Nathan has done in wood handles, anything for a collector, anything one off or remarkable in some way, and of course I would love a dagger should anyone want to part with one. Still looking for more Shivs, and more Utility fighters, would love a D2 Skinner as well. Many thanks to Nathan for making this thread available to us! WTT Natural unbuffed micarta FK with OD green sheath. Knife is like new having only cut some thin plastic one time. Will consider most brands of folders but I would be most interested in CRK, and will consider other CPK in trade. Text/call (573-614-1191) for fastest response 5am-10pm, otherwise PM or email [email protected]. GONE! if you post your authentic Conan the Barbarian collectors edition sword for sale (not a CPK related posting) I will edit your post to be about your My Little Pony collection and then I will mock you. I would like a FK so anyone willing to SELL then please let me know what you have to offer. I don't own any CPKs yet so I can't trade. I would like to buy a CPK EDC. Here's my offer: Cash, plus a set of my handmade, custom scales for one of your knives. Hopefully you have two EDCs and will part with one of them to me. I'll work up a set of custom scales and get you a pair in return (plus the cost of the knife). I can also do a set of handles for your FK or other knife. I work exclusively with premium woods, such as curly maple, walnut, koa, zebrawood, wenge, zircote, and a host of others. If you want to see my work, please go to my instagram (@inrangedesign) or PM/email me for pictures. PS - Thanks, Nathan for opening up this CPK marketplace. Would love to get a FK if anyone is willing to sell one! Edit: was just able to get my first FK thanks to this thread! Should be here this week! Oh Nathan this is awesome. Looking to trade for a CPK LC or FK. I've got a couple SKYCO fixed blades and a XM-18 3.5" spanto flipper. Only looking for CPK's. Would really like a shiv or fighter as well. Thank you for this thread Nathan!! I will buy outright D3V field knives. I am also willing to trade other fixed blades for D3V field knives. Trades would be mostly from the makers in my sig line and also Busse Combat and SYKCO. I would also either buy outright or trade for one more potato knife. 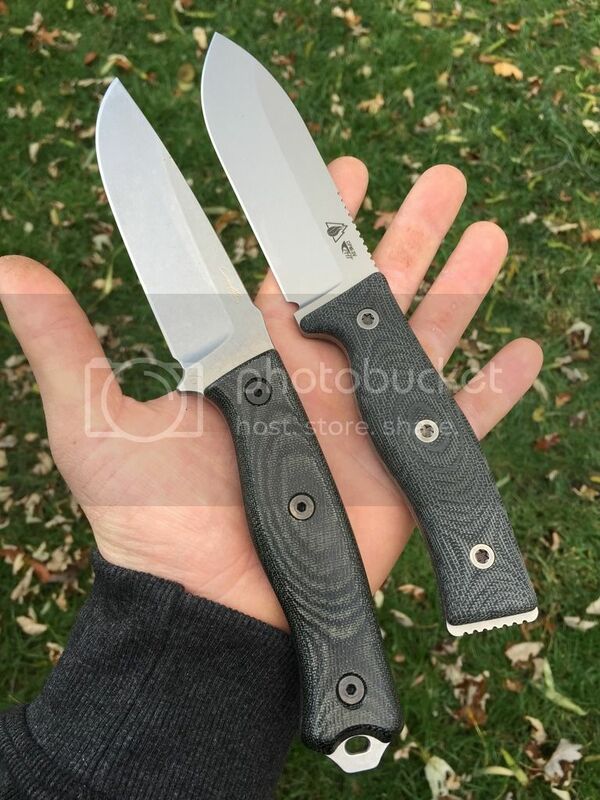 Also, I am looking to purchase a set of green & black G10 scales for the field knife. Secured these from Jo. Thanks again sister. Would happily trade a Swamp Rat R5 with buy brown kydex, lg teklock, and some cash for a D3V FK. Thanks Nathan for doing this. I like this thread already. I want to make myself a leather sheath for my field knife, so I may make a few for sale here as well. Also looking to buy a potato knife. If anyone has one they can let go it would make a great Christmas present for my fiancé that's trying to learn to cook. Thanks Nathan for opening this thread! I have been wanting an EDC since I discovered CPK this fall. I can pay cash or I also have a few Fiddleback Forge knives I would put towards part of a trade. Please PM me if you are interested. Would love to get a FK, users are okay as long as not abused. Let me know. No other CPK to trade but tons of other stuff or cash. Is love to take a FK of any kind off of anyone's hands who has more than one or wants to part with the one they have!